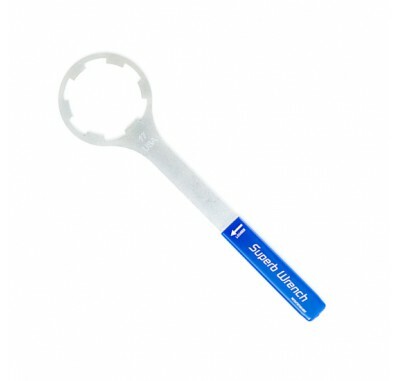 The Superb number 17 Wrench (SW-5-SS-17) is sure to be the last water filter wrench you'll ever need. If you have ever struggled to remove an old filter cartridge from its housing, or have broken a plastic wrench in the process, the Superb Wrench is the tool for you. Its solid metal construction can easily tackle any filter change. Plus, the printed directional arrow will prevent over-tightening or a broken housing. Superb wrenches comes in a variety of different sizes to fit any filter housing. The Superb Filter Housing Wrench fits several brands of undersink and reverse osmosis filter housings, including Pentek, Culligan, and more. Features the strength of zinc-plated, galvanized steel. Will not bend, bow or break. Crafted with a longer handle than most plastic wrenches for superior grip and leverage. Clearly labeled with a directional arrow to ensure proper direction when turning. Made in U.S.A.